Cape of Good Hope. Page 3. 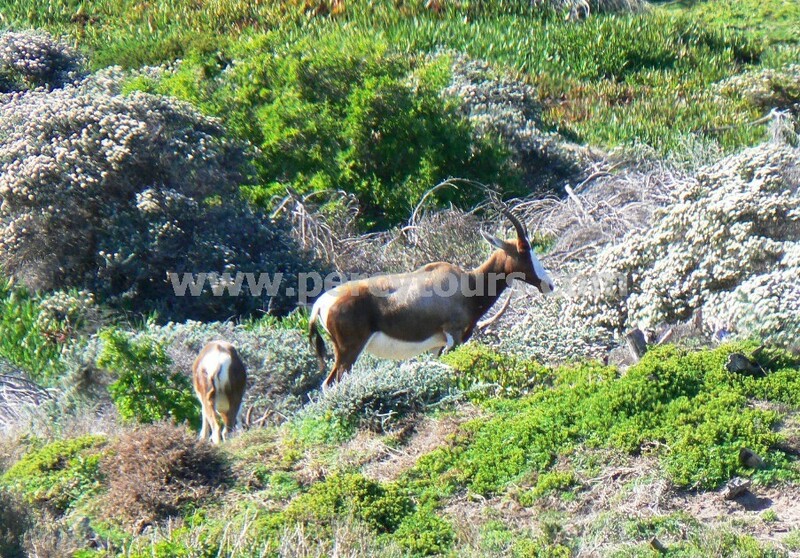 Further on we enter the Cape of Good Hope & Cape Point Nature Reserve. As we drive through the Cape Flora Kingdom Percy points out the rich abundance of indigenous specimens and with the eyes of a hawk he also has time to point out the wildlife such as ostrich, baboon and bontebok and when we stop to soak in the view he even manages to find an angulated tortoise, although I think he may have had it in his pocket all the time. We all like extremes and at the Cape of Good Hope there is a sign that testifies that the Cape of Good Hope is the most south western point of the African continent, but Percy will tell you that Cape Agulhas some 150 km to the south-east, has the title of being the most southernmost point. 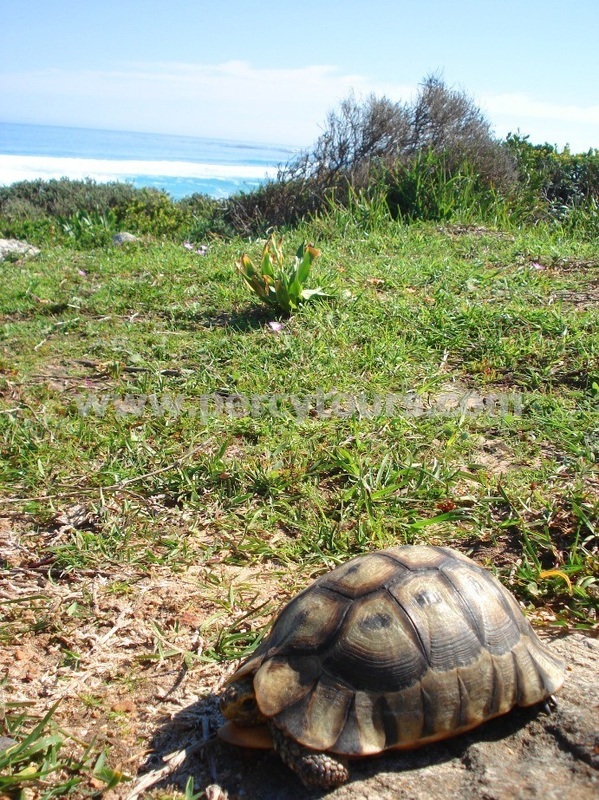 Being the most southernmost point has to have more kudos but Percy says that unfortunately for Cape Agulhas it does not have the spectacular beauty of Cape Point and the Cape of Good Hope. Cape Point is often thought to be the place where the mighty Atlantic and Indian oceans collide; the reality is that the position fluctuates along the southern and south-western Cape coast somewhere between Cape Point and Cape Agulhas. Standing at the Cape of Good Hope, the mighty ocean or who knows on this particular day maybe oceans, crash onto the shore, with the sun warming the strong wind, so pure and fresh that if it wasn't doing me good, it damn well should have been. 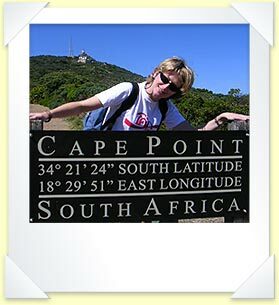 There is a path that leads from the Cape of Good Hope up to Cape Point, it is probably a very enjoyable walk, especially with the freshness of the air, but Percy suggest we take the more leisurely option and drive the short distance to Cape Point. At Cape Point we avoided the temptation to take the funicular railway that runs from the car park to the top of the peak, instead we enthusiastically climb the steps, along with what seemed to be half of the Indian navy also visiting this beautiful location today. I always thought one good reason for men joining the navy is that they got to wear white suits, unfortunately this does not appear to be the case for the Indian navy who instead chose a uniform more in keeping with an army of accountants, admittedly the gold insignias are not everyday office-wear but I think they need to have a word with Giorgio because their current attire just doesn't cut the mustard for navy boys. I digress, mainly due to the strenuous walk up to the Cape Point lighthouse, hey it was hot and I was slightly out of shape so a little delirium was bound to set in. At the top you start to appreciate that building a lighthouse at the end of a craggy peninsula has to be a job and a half and sadly as it turns out, to be a pointless one. The lighthouse once built was prone to being obscured by high fog and when it was seen it appeared “too early” causing ships to approach too close. Okay I didn't understand that last one, I think it is similar to the message that is often written on car wing mirrors, "Objects In Mirror Are Closer Than They Appear". I was going to ask the nearest Indian naval officer but then thought better of it. The bottom line is that the lighthouse is now a folly, having been replaced by a new one built at sea level, but I bet it isn't as nice. The weather was perfect to take in the views from Cape Point, Percy said we were there on a quiet day so I am assuming that the whole experience could be ruined on other days when the other half of the Indian navy joined their lot for a days outing. It is strange to see something so beautiful on a quiet and good weather day, that is also know as the Cape of Storms, but it only takes a little imagination to picture the Cape at its raging and roaring worse. There is path that leads to the end of the very edge of the peninsula, it has to be worth the effort but others will have to tell you about that experience because I was on holiday and I needed time to break myself in to the high adrenalin extreme sports activities. As we leave the Cape of Good Hope Nature Reserve, we head north hugging the western coast line. At Noordhoek Percy stops for a short time to allow me to take in the magnificent view, not only of the beach that seems to run for miles but also the whole village that stretches back from the coastal wetlands way into the distance. Along one side I can see houses comfortably nestling in groves of Milkwood and Yellow wood trees. Noordhoek is described as a country village and I am not surprised to learn that many an artist has settled here, as it would be hard not to gain inspiration from the surrounding landscape. If “Alpeness” was a word it would describe some of the scenery along the Chapmans Peak Drive, it has been described by some as one of the most scenic routes in the world and I would agree. With its hundreds of curves, the 9km road hugs Chapmans Peak and gives picture postcard views at every twist in the road. The road runs between Noordhoek and Hout Bay and Percy informs me that work first started on the road in 1915 and formally opened in 1922. It's now a toll road, no doubt to pay for the massive engineering work that had to be undertaken after rock falls that closed the road for some time in January 2000. We stop for a late lunch at a pub in Hout Bay which is located right on the white sandy beach and on the northern side of Chapman's Peak Drive. The beer was cold and the food good pub grub, that is if an ostrich burger was ever truly common pub fare. As it is a late lunch it seems right to rest a little while longer and take in the sun and for me to down another beer to finish the afternoon off in style.